In 2014 the OECD found that mild-to-moderate mental health comorbidity affected around 20% of the working age population and cost over 4% of GDP.1 The percentage of those affected by mental health co-morbidity and the value to which ensuing impairment affects countries outside the OECD is not known and has long been ignored. 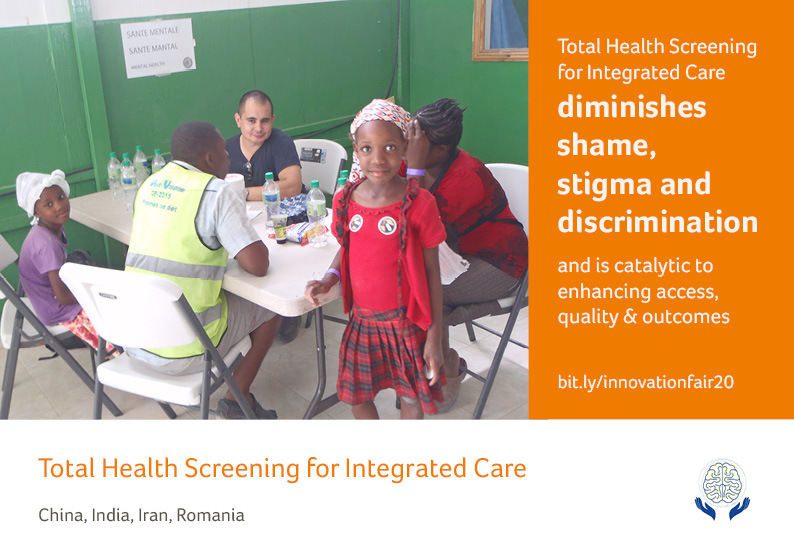 This program utilizes “total health screening” through a collaborative care model to determine the prevalence of mental disorders and other NCD co-morbidity in low- and middle- income countries. The presenters demonstrate how self-administered screening can be leveraged in a primary care setting to accurately determine clinical information for health teams and policy makers. Most non-communicable diseases are first seen in primary care, depression included. Depression, one of leading conditions in the global burden of disease and of disability is frequently misdiagnosed, underdiagnosed and undertreated, especially in low- and middle-income countries. Depression often presents as a co-morbid condition with other non-communicable disease, especially cardiovascular disease and diabetes. Therefore, it is important to screen for mental health, including co-morbidities, in patients,at the first point of contact with the healthcare system, i.e. primary health care centers. This study of depression and co morbidity in primary care in China, India, Iran and Romania screens patients for depression at the primary care centers; using the PHQ-9 instrument, a reliable, internationally validated questionnaire, that takes 3-5 minutes to complete, and can be administered by non-clinical personnel. The team hopes to expand to additional countries in Asia, Africa, South America, and the Caribbean so as to develop a more complete picture of the global burden of mental health co morbidity. The team is currently in process of developing a training course in integrated care for Africa and an Africa Global Mental Health Institute. This training course will implement and integrate data obtained from the total health approach demonstrated by this project. These studies were funded by voluntary contributions by the research team members in China, India, Iran, Romania, and the United States. Contributions made by the Romanian Ministry of Health, the participating academic institutions and clinical facilities in the four countries, and the physicians and members of the health teams. The Total Health Screening for Integrated Care, project consists of a cross-sectional study implementing mental health screening tools in the primary setting. The first four studies, which are the subjects of this project, utilized the Patient Health Questionnaire (PHQ-9) to determine the rates of depression in the populations studied. The PHQ-9 a self-report and analysis questionnaire, is a widely used screening tool to diagnose Major Depressive Disorder in the primary care setting. There are nine items which rate the frequency and severity of the major diagnostic symptoms of depression in the preceding two-week period prior to filling it. The PHQ-9 can be filled out in three to five minutes and can be administered by non –clinical personnel, which can subsequently be rapidly assessed and correctly scored by a supporting clinician. The severity of depression is determined by the total score range: 1-4= Minimal, 5-9=Mild, 10-14=Moderate, 15-19=Moderately Severe and 20-27= Severe Depression. Chart diagnoses provided non-psychiatric diagnoses to determine co-morbidity. The screening tool used in the studies is freely available online and has no associated licensing fees. It is also based on self-report which minimizes the amount of training required of primary care clinic staff. The main cost is that associated with reproduction of the one-page tool, liaison between the study team and clinic staff. As the instrument can be performed in less than five minutes and participants are recruited from the primary care clinic’s established population, no additional inducements are needed. The results from the four studies found similar results indicate that a large proportion of primary care patients may be either at risk, or suffering from major depression. The studies also confirm high levels of co morbidity with other non-communicable diseases, especially CVD and diabetes. These findings hold important implications for populations’ mental health, health systems performance, the delivery of care, health promotion, protection, and illness prevention – as well as the countries’ economies. Over 4,090 individuals were screened through the four countries – China, India, Iran, and Romania. This has helped provide useful and actionable information on the prevalence of mental health co morbidities in countries home to 2.7 Billion people and combined GDP of $11.674 trillion USD. Using the 4% of GDP estimate of the OECD, the total cost of comorbidity could approximate $467 billion USD per year. A multi-center, cross sectional study of patients visiting primary health clinics of three different regions of India was implemented. According to PHQ-9 scores 20.9% had moderate depressive symptoms, 19.1% had moderately severe depressive symptoms and participants 6.3% had severe depressive symptoms. Most patients with depression had medical co-morbidities – Diabetes Mellitus (46%) and with Cardiovascular Diseases (42.6%) were most commonly reported. In this study, the PHQ-9 questionnaire was administered, using a cross-sectional study design, to 1710 patients, that referred to primary care offices in Romania. 8.4% had moderate depressive symptoms, 4.4% had moderately severe depressive symptoms and 1.5% had severe depressive symptoms. Cardiovascular diseases were the most frequent co morbidity (56.8%). Cardiovascular co morbidities were found to be possible risk factor for a PHQ-9 score≥10 [unadjusted odds ratio 2.29 (1.69-3.09)] and correlated positively with total PHQ-9 scores (r=0.25, p<0.001). However cardiovascular co morbidities were not independent predictive factors for PHQ-9≥10 when adjusted to other co morbidities, lifestyle and financial status. This research was conducted in two geographically distant and socio-culturally different regions of China to study the prevalence of depression in the primary care setting. A secondary objective was to investigate the relationship between depression and chronic medical conditions e.g. Diabetes Mellitus (DM), Cardiovascular Disease etc. A total of 823 people (51.0% women, 49.0% men) were screened with PHQ-9. 16.4% had moderate depression, 5.7% had moderately severe depression, and 2.4% had severe depression. Patients with DM were proved to have the highest PHQ-9 scores (7.7±5.8), followed by Cardiovascular Disease (7.4±5.5) and Gastro-intestinal Disease (7.2±3.4). Sorel E. (2015) Total Health for All in the 21st Century. Sorel E. 21st Century Global Mental Health (2013) Jones & Bartlett Learning. Burlington, MA. Making Mental Health Count. OECD Health Policy Studies.